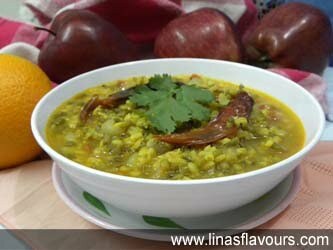 Soak moong dal in water for 4-5 hours. This is optional, but soaked dal cooks faster than using it directly. Take a pan and heat oil. Add mustard seeds, cumin seeds, asafoetida, ginger, garlic paste and stir it for 2-3 times. Add onions and saute it for 3-4 minutes till it turns translucent. Add tomatoes and saute it for 2-3 more minutes. Add red chilly and turmeric powder, green chillies and saute it for a minute. Remove water from moong dal and add it. Cook it for a minute in onions and tomatoes. Add 1 cup of water, close the lid and cook it on medium flame, stirring it occasionally. Cook it till it is done, add water if there is a need. Garnish it with coriander leaves and serve it immediately with rice, roti or parathas. If you are serving with roti or parathas then keep the consistency of gravy thick and if you are serving with rice then keep slightly thin gravy.